Stuff is all we need. Reflections on Thanksgiving. After narrowing this down over several years, the one thing that really makes Thanksgiving dinner for me is the dressing. It’s warm. It’s soft. It’s filling. It’s simple. It’s comfort food. It tastes good. With plans to have Thanksgiving dinner at a nearby buffet, there would be no cooking at the homestead this year. That left two gaps to be filled. The first, the gap in the wallet. The second, the dressing gap. Now the buffet would have all the turkey, gravy and dressing anyone could want. However, with the large choice of different foods at a good buffet, it’s a shame to fill up on turkey, dressing and gravy and ignore the rest. That rather rational thinking left a problem to be solved. The solution was Thanksgiving breakfast. With a long time until dinner, there was that emptiness in the stomach that needed to be filled now. At the same time the emptiness in the head started to fill with images of warm steamy softly rich savory stomach filling dressing. Having just gotten out of bed, there was also what is a usual dearth of clothing. Desire and dearth met in the middle, creating this wonderful non-recipe and the title of this post, Dressing Without Clothing. The next time you feel the need, try this. It’s fast, inexpensive, easy to make, and makes you feel productive. Clothing optional (if you take the optional route, avoid cooking bacon). Saute the onion, celery, carrot and basil in the olive oil for about 5 minutes. Add the water, bringing to a boil. 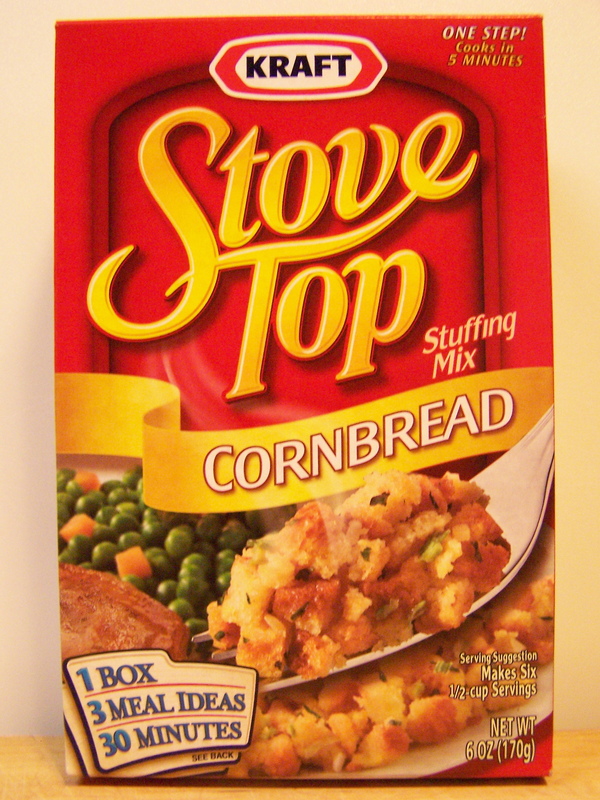 Stir in the contents of the stuffing mix pouch. Cover. Remove from the heat and let stand for five minutes. Fluff with a fork. This entry was posted on 11/30/2011 at 08:18 and is filed under Recipes, Recipes, food, cooking and related items. You can follow any responses to this entry through the RSS 2.0 feed. You can leave a response, or trackback from your own site.